We will probably be renting a car for our vacation this year. We are driving (roundtrip) around 1800 miles, across several states, plus touring locally once we get to our destination. Normally we take my spouse’s minivan. It is roomy and comfortable for his long, leggy body. This year, though, we are taking our precious grandson with us and the van just isn’t as reliable as it needs to be. It has over 124,000 miles on it and the last time we took it on a trip, it started stalling out and the brakes smoked going down the mountain! I’ve been trying to persuade my hubby to go ahead and get a newer van – we’ve got the money set aside for it, but so far no luck. The sales tax, plus the ongoing higher property tax and insurance are really turning him off – and the van does fine if we drive it locally or just for a few hours to the lake. So, instead of trying to cram my hubby, my grandson, myself and all of our travel things into my little Toyota Camry Solara (read that convertible with very little trunk space), I’m looking for a mid-sized SUV to rent for a couple of weeks. Of course, I want the best deal possible, so I went scouting to see what I could learn about getting the best deal on a rental car. Here is what I found. Choose the right car for your needs. Usually, if we fly somewhere and then rent a car, we just get the smallest (least expensive) type available. This time however, my criteria are different. I want this vacation to go well and that rental car will be our daytime home for 12 days. It needs to be comfortable and roomy. But, in looking at the prices, a mini van is much more expensive than a mid-sized SUV and the SUV should be more than adequate for 3 people and their baggage. A full sized car would actually work well, except that the seats would be too low for my spouse. Reserve well ahead of your need. In summer, on holidays and during other peak periods, rental rates go up as they do when you get closer to your dates. By reserving ahead of time, you can probably get a better rate (and make sure a car will be available). Our trip isn’t for a month, yet I will be making our reservation in a few days. Don’t rent from an airport location. Airports are notorious for tacking on fees and taxes. Go the extra mile to get to an offsite rental car location. Some (like Enterprise) will actually come pick you up – although I’m not sure they would do so at a major airport! We will rent a car once we get to my grandson’s house and leave our car parked in my son’s driveway. There are numerous car rental companies and locations in the major metropolitan area close to my son’s home. Really think about the extra insurance. Everyone says don’t get the insurance, that your own car insurance (or perhaps your credit card) will cover you. We rented a car in Salt Lake City in 2003 and had a tire go flat (or get punctured) in the hotel parking lot over night. Because we hadn’t taken the insurance, we ended up paying for a new tire with installation and etc for that rental car. I’ll take a look at insurance this time, but probably still won’t purchase it. When I priced it, the daily rate to add insurance was around $25! Watch the rest of the extras. I searched several online sites to see what is available and apparently you can add quite a few things on these days. Think about what you actually need before signing up for the extra fees! Whew – even without the car and the gas – you could be paying $74.95 A DAY if you choose all the options!! Do a thorough walk around and note defects. Take advantage of that walk around, even if you are in a hurry. 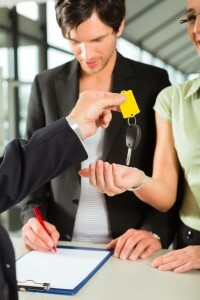 Note any dings, dents, scratches and other defects and make sure the rental car agent documents them on your paperwork. You don’t want to be charged for them later. If you are going to be gone most of the week, check out whether or not you could save money by renting for the full week. Some rental companies will give you a lower rate and still not charge you for days you didn’t use in the week if you return it early. Some companies will make you stick to your original rental period. Most rentals are for the business week. By renting on the weekend you could shave some bucks from your bill. When I worked, my company had an employee benefit that let us rent cars at a discount from several of the major car rental companies. Check your credit cards and loyalty programs (airline, motel and etc) to see if they have partnered to give discounts for car rentals. Use online services to find deals. There are aggregators out there, like Priceline or Car Rental.com that can help you find deals online. Watch the fees though. Make sure the sites are including everything, including all taxes and fees. Look for coupons and discount codes to use as well. Prepay if it helps and you don’t mind a cancel fee. Some companies offer big discounts if you prepay when you make the reservation. I found a deal for a mid-sized SUV at Budget rental for $357 (taxes and fees included) for 11 days, unlimited mileage if I prepay. Even with a discount code, if I wait until I get there to pay, it would be around $377 for the same period. The cancel fee is $10 though. What techniques have you used to knock down the cost of renting a car? What an informative article and mentioning to make sure the vehicle fits your needs is “spot on”. DW and DD2 flew out to California last year and rented a car. Of course they chose the cheapest most basic model. Upon arrival they were introduced to their car ….which DD2 said was “a clown car” which would only hold one of her bags let alone her Mom’s. The gal at the rental place didn’t bat an eye and immediately put them in a more suitable vehicle. Of course it cost a bit more…but at least the option was available. If it would have been a busier time this would not have been an option…and the trip would not have been as pleasant. Thank you Enterprise…. Glad they were able to get something suitable. I hate renting a car because I always feel like I have to buy the expensive insurance. I always buy it because whenever I have had a rental car, someone has ALWAYS hit it when it was parked in a parking lot (when I was not inside of it). I have had numerous hit and runs so I just always buy it. It stinks though! Wow that is bad luck. We are covered by our own car’s insurance for collision – on a rental. I checked it out before I rented last time with our agent. I thought I got a pretty good deal. That’s a good tip. I couldn’t find any though when I searched.